NEW! 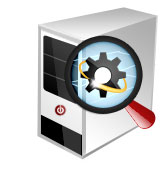 Super Tune-up Definitions™ identify more problem programs to optimize startup and keep your PC fast and safe. Your PC is slow ... and you do not know what to do? Difficulties to load websites or videos? Slow start and launch programs? As the award-winning optimization software, System Mechanic® has been updated to deliver even more speed and power while stabilizing and decluttering your Windows® machine. 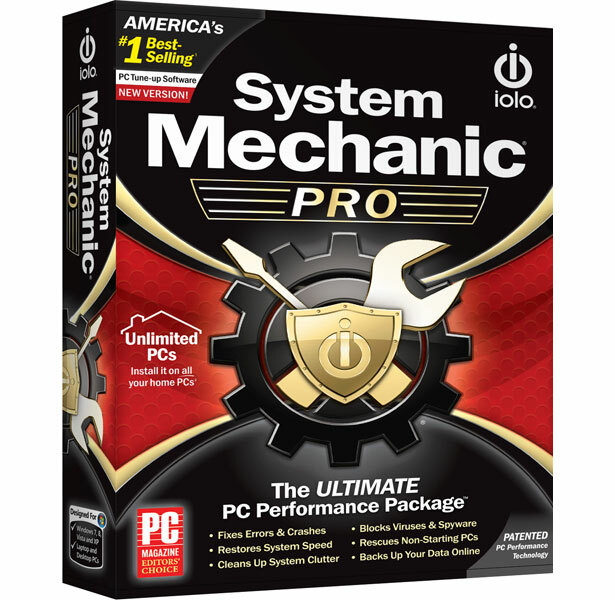 System Mechanic is the world’s No.1 best-selling and most awarded computer performance software, with over 45 million users worldwide, hundreds of 5-Star and Editor’s Choice accolades, and countless independent lab certifications since 1998. PCs slow down over time due to everyday use. Simple tasks that used to take minutes now feel like they take hours. With normal everyday use, PCs can accumulate problems that cause annoying errors, crashes, and freezes. Without regular cleaning, PCs are plagued by gigabytes of junk that waste precious drive space and memory. 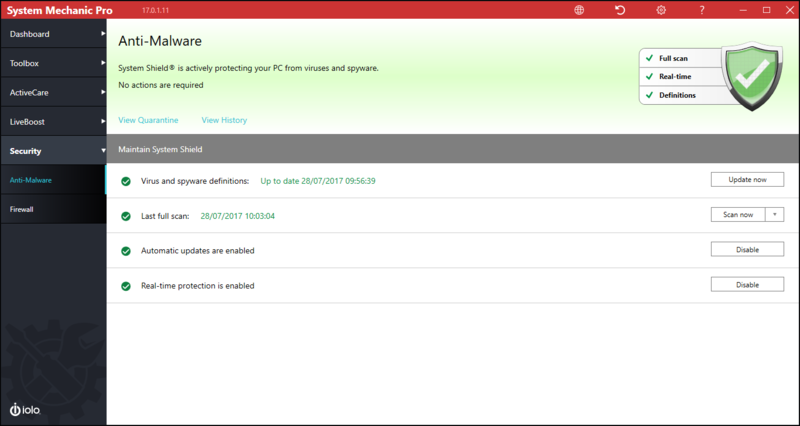 Security flaws that an antivirus overlooks let hackers gain access to your PC, resulting in financial damage and data loss. Improved software update frees up to 48% more RAM for resource-heavy multitasking. Accelerated dashboard now launches up to five times as fast as the previous version. Accelerated repair removes Windows and internet junk files up to twice as fast* as the previous version. 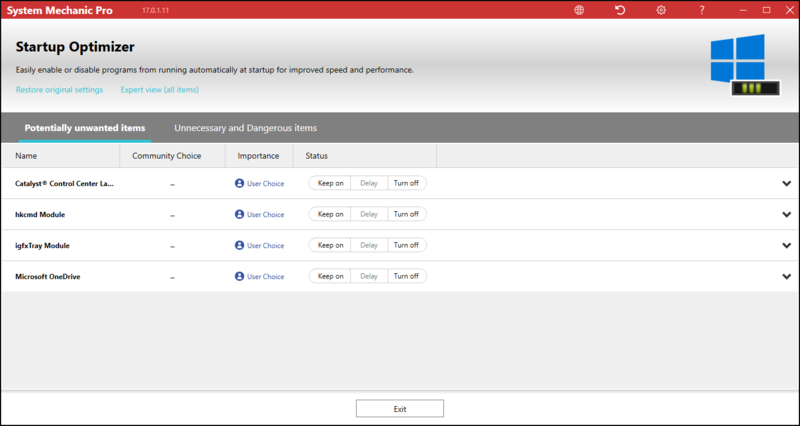 Improved Super Tune-up Definitions™ identify more problem programs to optimize startup and keep your PC fast and safe. The ability of a computer to respond quickly to the operating system and the programs it runs is based on a critical triangle of components: The Central Processing Unit (CPU), RAM and the Storage Drive. If performance at any point on this triangle is impeded, the entire triangle is affected and your computer develops sporadic lags and glitches. LiveBoost™ Technology opens the door to “performance at the speed of thought”, even though today’s programs and applications try to aggressively monopolise your computer. OptiCore™ – Unleashes full CPU power for your real-time demands. OptiCore is new technology that spots and contains greedy programs and ends the conflict between your needs and what the operating system needs. OptiCore is optimised for single, dual, quad, 6 and 8 core PCs and reduces lag on Windows 10, 8.1, 7, Vista and XP. RAMJet™ – Instantly releases trapped memory just when you need it. RAMJet™ automatically recovers trapped memory in real time and helps ensure your PC stays responsive to your multitasking needs. AcceleWrite™ – Optimises file organisation on both solid state drives (SSD) and traditional hard disk drives (HDD). Working deep inside the Windows operating system, AcceleWrite™ increases the efficiency of how files are written to the drive. By minimising the random writing of data, AcceleWrite increases overall system performance and largely reduces or eliminates the need to perform secondary file optimisation (such as disk defragmentation), saving your system time and energy resources and helping prolong the life of your PC. Modern versions of Windows depend on a central communication system that allows software and hardware to exchange critical information before making decisions. Because of its complexity, it is prone to various levels of corruption over time—which can result in a variety of problems. Core Data Recalibrator, a unique technology premiering in System Mechanic 18, automatically corrects Windows information corruption. It accurately detects and automatically repairs these problems before they can destabilise a system, keeping Windows and all of your software, apps, and connected devices working in unison so they never miss a beat and your PC is always ready for action. Stability Guard™ proactively intercepts threats to system stability by automatically watching for rogue programs and unauthorised configuration changes that reduce system stability. It uses complex algorithms to track and correlate the root causes of freezes, hangs, crashes, errors, and restarts. It also provides a revolutionary at-a-glance view of PC reliability over time, as well as the specific programs and system changes that affect it. Now greatly enhanced to detect even more “Commonly Redundant or Unnecessary Decelerators and Destabilizers”, CRUDD Remover’s expert intelligence takes the hassle and guesswork out of finding, classifying, and presenting them all, so you can choose to remove unnecessary software bloat. Tune-up Definitions™ allow System Mechanic to individually tailor its diagnosis, repair, and optimisation tools for each unique PC configuration, providing personalised solutions to emerging performance threats using ActiveCare technology. System Mechanic is now fueled by well over 36,000 independently identified solutions to common issues that arise from everyday use. This makes all the tools and functions that rely on this crucial data more effective than ever before. New real-time technology that optimises file organisation on both solid state drives (SSD) and traditional hard disk drives (HDD). Working deep inside the Windows operating system, it minimises the degree that a new file, or changes to existing files, will be stored inefficiently. By minimising the random writing of data, AcceleWrite increases overall system..
Start Windows significantly faster by eliminating unneeded or hazardous start up programs safely. Startup Optimizer™ is now expanded and even more simplified. Now it’s easier than ever to identify and root out unwanted programs that silently leach horsepower from startup and other high priority activities. ActiveCare is now easier than ever to configure, with setup profiles that allow you to apply one-click maintenance options to your entire PC without the guesswork. System Mechanic’s exclusive idle-time optimisation kicks in when your PC isn’t being used and releases full control when you return. Speeds up overall program responsiveness by re-aligning all of a program’s dependent files on the hard drive. The problem: program misalignment can be a major cause of system slowdown created by errant Windows and software updates. It leads to progressively slower program launch and responsiveness as dependent files become scattered all over the hard drive. Program Accelerator’s unique patent-pending technology adds sophistication to enhance defrag tools, such as DriveAccelerator™, and move related files back together. Program Accelerator jump-starts your sluggish programs by fully re-aligning your whole PC file system. Boost speed by turning off unused background programs. Perfect for gamers, video and sound engineers, artists, web designers… or any serious computer user who requires an instant shot of raw, fast, focused performance. 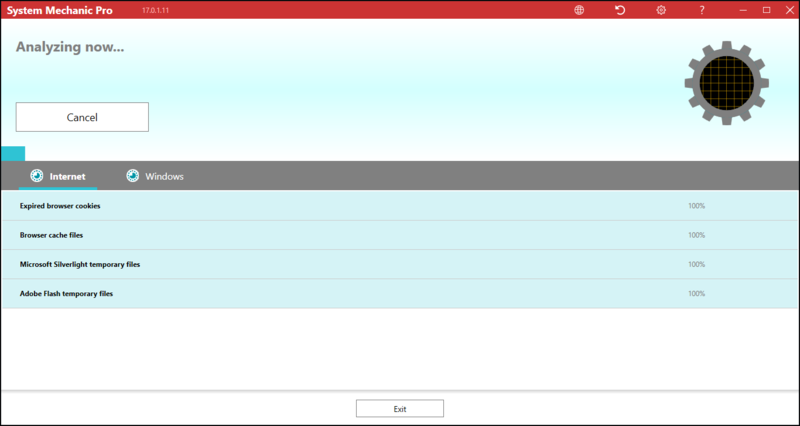 Repair, compact, defragment, and backup your Windows registry in one step. 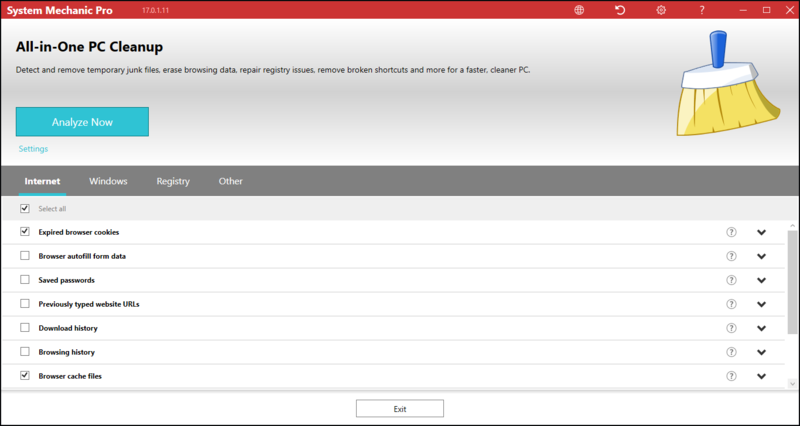 Integrates all of System Mechanic’s powerful registry tools to provide complete and seamless all-in-one care for the Windows registry, safely performing the entire battery of critical repair, maintenance, and optimisation procedures in one step. This tool also leverages System Mechanic’s technology with more effective problem-detection, improved overall speed and efficiency of scans, and enhanced reporting that provides more detailed scope of errors. 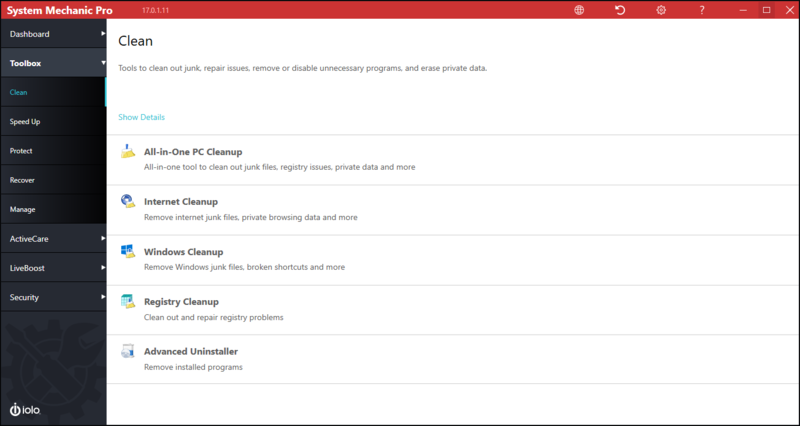 All-in-One PC Cleanup has been greatly enhanced with additional junk file patterns, new ways of detecting and removing insidious system clutter, and improved scan speeds. Designed exclusively for the Windows 10 entitled user interface, the PC Health Status App lets you keep track of your system efficiency and health status at a glance. Both the app and gadget include a running list of recently performed repairs and optimisations, and offers quick access to commonly used tools, such as Memory Mechanic® and the new EnergyBooster™. Permanently wipes files in the Windows Recycle Bin, so they can never be recovered. Incinerator® technology is now integrated into the Windows Recycle Bin, providing you with the choice of standard file deletion or the Department of Defense 5220-22M compliant technique for maximum security when emptying the Recycle Bin. The System Mechanic Jump List gives you instant access to frequently needed information and features, such as system status, Memory Mechanic®, Energy Booster™, and more. The latest version allows you to launch a full scan and repair straight from your desktop. 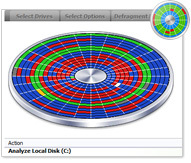 Instantly defragments RAM and liberates resources held captive by memory leaks.System Mechanic’s Memory Defragmentation tool is designed not only to reassemble your RAM into a neat, contiguous order for significant performance gains, but also to hunt down and release all of the resources held captive by memory leaks within sloppy programs. At your command, securely wipes away all traces of personal and confidential computer activity you specify. Better than simply clearing the cache, it uses military-grade Incinerator® data shredding technology to safely and permanently whisk away the trail of activity left in over 45 locations by Windows, web browsers, media players, and more. 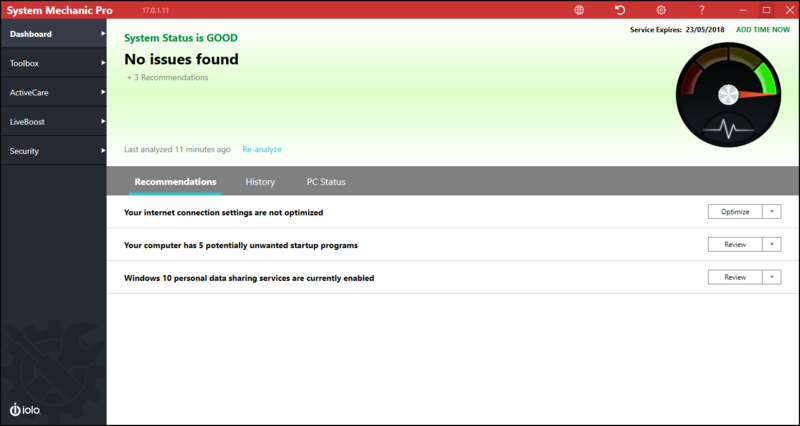 Now with dozens of additional cleanup targets including all major web browsers and chat clients. Some of the most important Windows system files are locked by Windows and can never be defragmented using conventional defragmenting tools, but System Mechanic’s Boot-Time Defragmentation can defragment these special files conveniently before Windows loads. Now, all of System Mechanic’s boot-time operations come with a series of prompts and options that offer you increased control in order to avoid inopportune delays while starting up the PC. A multitude of improvements, enhancements, stability augmentations and general fixes have been incorporated into version 12 for the most effective and reliable performance optimisation product to date. Keeps your PC running swiftly and stably by automatically installing critical driver updates. Designated Drivers™–lets you update all of your PC’s drivers with just one click, now making driver updates a painless process. Designated Drivers is the only tool of its kind to exclusively use Microsoft-approved driver updates, which have gone through two rounds of quality assurance testing to ensure the updates are safe, reliable, and broadly compatible. Many homes have multiple computers, and trying to keep track of the number of software license activations allowed across all machines can become complicated and frustrating, as well as costly. 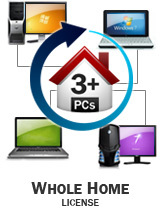 Whole Home License® lets you install System Mechanic on all your home PCs at no extra cost. System Mechanic’s new Internet Connection Repair technology detects bad connections and uses a regimen of proprietary technology to not only repair and reconnect your computer, but also help ensure the connection is as clean, fast, and reliable as possible. Guided Recommendations fuses together three powerful technologies; Tune-up Definitions™, TrueImpact™ and the collective intelligence of the System Mechanic community to provide guidance on removing additional hidden programs that can bottleneck your PC performance. These collective recommendations, along with detailed descriptions and the impact measurement of each of these programs, gives you the power and to make at-a-glance decisions about how to make your computer faster and more efficient than ever before possible—all in just a few clicks. Streamlines, optimises, and prolongs the life of modern solid-state drives, keeping them running at peak performance. SSD Accelerator™ proactively optimises solid state drives to keep them running at the peak of speed and efficiency. SSD Accelerator has also been designed to work together with System Mechanic’s other drive optimisation tools such as AcceleWrite and ActiveCare technology in order to ensure that all of your data storage drives are automatically optimised for maximum performance and longevity on a regular basis. Windows® users increasingly concerned about the involuntary collection of their personal information will find the new Privacy Shield suite of tools a valuable addition to new System Mechanic® 18. Privacy Shield introduces a host of options for managing Windows 10 privacy features from one convenient location in System Mechanic. Privacy Shield’s easy-to-use wizard allows you to disable Windows features that may compromise your privacy, including those that can share your Wi-Fi network connections with your contacts and collect information regarding your browsing habits, program usage, and more. In Windows 10, these include Microsoft Data Collection and Telemetry Services, the Wi-Fi Sense Service, and the SmartScreen Service. Maximises 100% of core processor power when you begin a system-taxing operation such as; gaming, programming, graphic design or multimedia task. Also finds and scales back resource-hogging programs that can slow you down. Discovers memory trapped by applications that are no longer using it, and frees it up for the apps that need it. Misalignment of programs Program AcceleratorTM aligns applications and improves their performance. 9.83 / 10 "System Mechanic is the best PC system utility app"